Merri and I hope you have a joyful Easter celebration tomorrow. One wonderful part of having an international lifestyle is that we have gained so many perspectives on so many concepts. 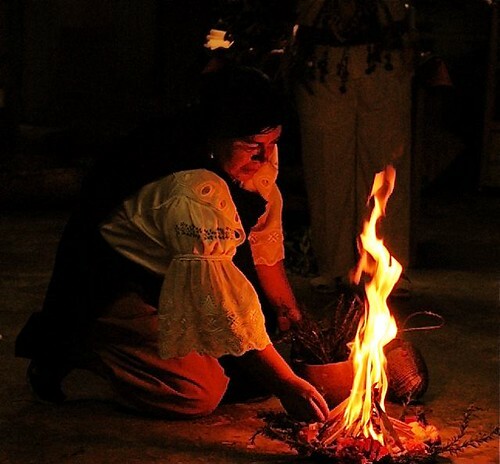 I would like to share one viewpoint on Easter we gained from Ecuador shamans, with you. We were hiking our hacienda Rosaspamba enjoying its incredible panoramas, abounding bird life and gained an unexpected Easter message from a shaman whose religion does not celebrate Easter. Dawn rose orange, glinting over virgin forests and a veil of rolling mists. Merri and I were with two shamans standing deep in the jungle watching the morning sunrise, smelling the fresh greenness of the forest and listening to a serenade of thousands of bird songs. Merri and me hiking with the shamans. 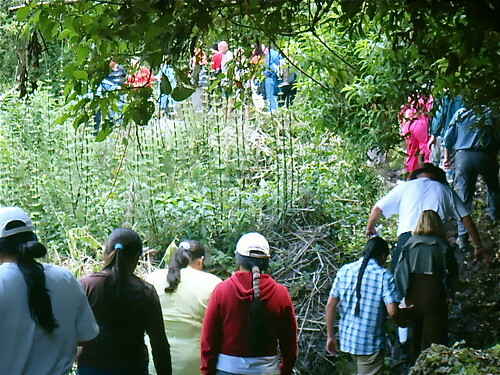 We walked in the dawn, examining mist covered medicinal plants that help cure ulcers, ringing in the ears, infections, stomach pains, high blood pressure, itching, bronchitis and other diseases. We learn about Dragon’s Blood, Una De Gato and dozens of others. One important lesson the shamans brought as we worked our way through the deep woods came from their sense of play. These shamans have nothing in material terms but as we entered the woods they were gloriously happy just to be alive, amidst nature and with friends. This day was one more adventure for them to be grateful for. Their sweet simplicity and spontaneity kept them alert in the moment, no cares for tomorrow, no regrets of the past. Each moment was their playground. When they saw a vine hanging by a cliff, we stopped and swung, yelling like Tarzan! When the correct tree appeared we quit looking seriously at medicinal plants and learned how to use vines on our feet to shimmy straight to the top. When we reached the waterfalls, we took a dip. This was their gift and Easter message. Celebrate being born again on every day. Shuck off the things that are killing us and be born again. The shamans showed us we should celebrate Easter, by living its celebration every day. So here is the message I send from Merri’s and my hearts and from these two precious men. Live for the moment, every minute, every day. Let the rising of each dawn bring you a new birth. Celebrate being born again today. Then tomorrow do it again and the next and the next. Then do it every day. There is no past to regret. There is no future to worry over. There is just today so live, love and enjoy. Easter reminds us of this and I invite you to join me this year in living as if every day is Easter. Merri and I send our wishes for a wonderful, fulfilling day with special meanings that fulfill you the year through. This message outlines how and why, in the 1960’s, due to strict OSHA regulations, the government curtailed a simple (and incredibly low cost) amino acid that can help improve cardiovascular systems, increase memory, improve vision, enhance vitality, expand energy and extend lifespan. One year when we had a Super Thinking Course at our farm. One of the course delegates was a doctor in his eighties. He had the energy and looks of a much, much younger man. When asked about his secret of youth he said his vitality was based on several factors. A few of the habits you would expect, such as good diet, sufficient exercise and plenty of activity in a strong, purposeful life. Then he explained another secret of his youth and energy: chelation. Then, he said, he had learned about Beyond Chelation a vitamin-mineral formula created by Dr. Gary Gordon. The doctor said he found this so effective that he shut down his clinics and exclusively used this simple formula which he (after seeing the results of the formula) felt had better results than I.V. chelation therapy. Over 30 years of Dr. Gordon’s experience as a clinician, researcher and educator in chelation therapy were behind this comprehensive cardiovascular nutritional supplement, designed to maintain and promote vascular health, mental and physical well being. Our client and doctor friend gave us a month’s supply of this formula. He thought it would be excellent for us and would help us with traveling also. Merri and I tried this product ourselves and felt great, plus we loved the savings we enjoyed. It was so much less expensive than all the numerous other vitamins and minerals that we had been taking. We actually were spending less! In addition this system was so convenient. Everything was in one simple daily packet. Especially when we traveled we just bring along a packet for each day we are on the road. No more loading up pill boxes or bringing bottles (or suitcases full of bottles) of vitamins and stuff. As is so often the case when we like something we start talking about it and pretty soon, a batch of friends were taking Beyond Chelation and telling us great things about their experiences. They reordered so much of it through that I decided to make it available to all my readers. But Beyond Chelation had not been evaluated by the FDA. Though the product was not intended to diagnose, cure or prevent disease and was only to be taken as a food supplement, the government soon shut it down. Fortunately the main ingredient EDTA is still available. This is an alternative for those who should be taking chelation or if if they’ve already had chelation or can’t afford it, or simply want to take advantage of new breakthroughs that permit a safe and effective way to reduce the risk of heart attack and stroke. In addition to promoting heart health, this supplement has multiple anti-aging effects. Dr. Dean Ornish of Sausalito, California, long ago demonstrated in a five-year study published in the Journal of the American Medical Association that heart disease could be reversed. Vascular disease can be arrested and cured. However, for those unable to stick to an extremely low-fat diet (below 9% in total fat content) and the meditation and exercise mandated in Dr. Ornish’s program, formulas with EDTA may provide similar effects. Significant improvements of blood flow to the legs, head and heart of patients experiencing problems of clot, spasm and arrhythmia with the use of oral chelation formula have been so powerful that fewer than 5% of subjects in studies on the use of chelation have had to have heart surgery. It is a largely hidden fact that the main blood vessel leaving the heart of a healthy 80 year old man has 140 TIMES more pathologic calcium in it that the main blood vessel of a healthy boy of ten. By means of chelation therapy, this unwanted calcium (causing a build up of vulnerable plaque, hardening of the arteries, and potential heart problems) is removed from blood vessels and put into water-soluble complexes (chelates), which are readily excreted through the kidneys. Clinical observations reveal, however, that the amount of calcium in bones is not affected by the removal of calcium in the arteries nor is it diminished by the use of EDTA chelation therapy. Gain the path to natural health which reduces stress and creates body, mind and emotions that are crystal and clear. Stress is a major contributor to disease. Any kind of stress: weather, physical, bad food, money problems or simply a boss, spouse, friend or government being unfair can clog the purity of our natural health. Tiny meningeal lymph vessels that drain dangerous toxins from the brain were just discovered last year through research by a PhD professor in the University of Virginia Department of Neuroscience. These lymph drains follow a major blood vessel into the sinuses, an area difficult to image and are so close to the blood vessel that were amazingly, but simply missed. According to Nature, this is a stunning discovery that overturns decades of textbook teaching. Research is showing that congestion of this purification system is linked to reduced clarity of mind, depression as well as inflammation, autoimmune imbalances. Because almost every neurological disease has an immune component to it, these vessels may play a major role in improving functions of the mind. Tweaking the lymph system could become a regular medical procedure. Improving the brain’s lymphatic system, for example, may help clear protein clumps in Alzheimer’s or rogue immune cells in multiple sclerosis. While the medical establishments are busy looking for cures to diseases (that will bring them profit), there are ways we can improve our metal clarity, enhance our moods and reduce the risk of diseases in the brain as well as the heart. The purification report in our three Natural Health reports shows how to clear our lymph system. Stress is a major impediment to health, wealth and the pursuit of life’s purpose. Another problem is that when a source of stress is removed, the results of the previous stress do not all go away. The body stores stress which creates negative health cycles. The more old stress is stored, the harder it becomes to deal with current stress. To improve our natural state of health, we need to remove stress from our day-to-day lifestyle and remove the stored stress in our body in the form of toxicity. We need to remove it from the inside out, at the most subtle molecular levels in the body. 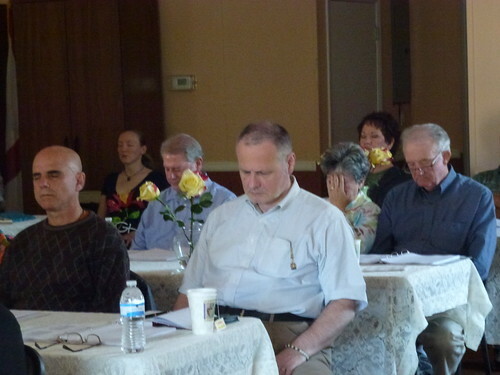 We also should purify the body from the outside in from the skin into our core. We need to remove stresses of the past (stored toxins) so we can work on stress in the future. This is why the second of our three natural health reports is about purification. I studied for decades with healers around the world because chelation can help kick-start better health. Here is an excerpt from our health report on purification. The ultimate form of purification is to be clean and pure. Yet this is not easy to do. There are toxic chemicals that can infect us every day. These poisons can be in our food, medicine, clothes, car, pots and pans, water, air and teeth. Some of the poisons are even hiding in plain sight, in places that promote purity! Take BPA as an example. There are concerns about the effects of BPA on the brain, behavior, prostate gland, fetuses, infants and children. The Food and Drug Administration is taking steps to reduce human exposure to BPA in the food supply. Imagine this. To maintain natural good health we shop at Whole Foods, pick only organic, get only water that is in BPA-free water bottles and carefully stay away from BPA-filled canned food. We check out and cringe at the higher prices as we examine the receipt, not knowing we were just then contaminated with BPA…twice! An article is entitled “Toxin BPA Found on Receipts from Safeway, Whole Foods, Walmart” explained that BPA easily transfers from cash register receipts to skin, where it penetrates at such a deep level that it can’t be washed off. There was a study to find out how much BPA is on the store receipts that many of us touch every day. Most thermal paper is coated with BPA and is widely used for point-of-sale receipts, prescription labels, airline tickets and lottery tickets. A test of 36 receipts from popular retailers yielded some disturbing results: BPA was found in significant levels in receipts from chains including Safeway, KFC, Whole Foods, Walmart, and McDonald’s. We need ways to purify the toxins we pick up from daily life. There are three reports on how to have better health naturally including the report on purification. All three are available online. The report looks at all the tricks of cleansing the body that Merri and I have learned in our nearly 50 years of global travel. Order all three Shamanic Natural Health Reports worth $59.85 for only $39.90. I have written three reports on how to improve our natural health. These reports have been decades and millions of miles of travel in the making. We’ve invested thousands of hours into learning the skills of health self-reliance and resilience, identifying the best foods and combinations and sifting through loads of seeming contradictions to get to the facts about “Do it Yourself” longevity and natural health. Imagine… never worrying about what we eat ever again and reducing the risks of hospitalization and health care’s outrageous costs! “Sunski” is the Andean word for eating. “Sunski” is one of the three reports. It shows a way to eat that strengthens and purifies as it stops adding toxicity from eating. Sunski is a delicious, healthy “self defined” cleansing process. One lesson in Sunski shows how to correct a simple mistake that most of the Western population makes which increases the chances of adding and retaining weight by 84%. “Sunski” combines lessons about healthy eating that we learned from years of working with Ayurvedic health masters and then living for years with the Ecuador Taita Yatchak and his apprentices. The third report, “Smooth Moves for Longevity” is about inner exercises that make you healthier. “Smooth Moves” shows physical ways to gain better health that are too easy to call exercise. Many of the moves you will learn strengthen the smooth (rather than voluntary) muscles. Many of the routines go beyond EZ. “Smooth Moves” are easier (but perhaps healthier) than exercise. Smooth Moves combine lessons that Merri and I have learned about smooth and easy exercise while living and working with natural healers from around the world over the past 40 years. Each of the reports is available for $19.95 a piece. The three reports are “Sunski”on nutrition and “Improving Natural Health through Purification” on purification and “Smooth Moves for Longevity”. However, I would like to make this special offer. Order all three Shamanic Natural Health Reports worth $59.85 for $39.90. These reports can help improve your natural health and the extra energy you gain can change your life. 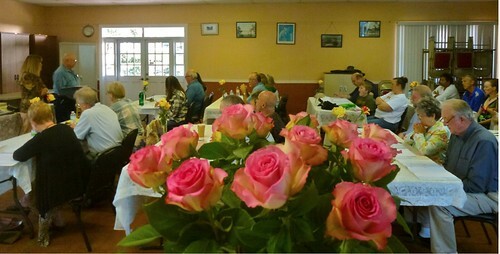 The mother of one reader in Tampa, Florida who attended one of our health courses wrote: “Hi Merri and Gary: Thank You! Thank You! Thank You! Our daughter called me from the airport. She was very happy, excited and told me all about the wonderful time. She could not stop talking about you guys, about the seminar and about the whole positive experience. The three health reports can help make your life better. We guarantee it. Here is our guarantee. Read the reports. If you are not totally happy, simply let me know. I’ll refund your payment in full. You can keep the reports you have received as our thanks for trying. You have nothing to lose except the fear of having no way to avoid a health care system that may be worse than the illness. You can receive “Improving Natural Health through Purification” – “Sunski” and “Smooth Moves”, plus a special report on a health tip that almost no one knows, “The Secret of the Hogberry” all guaranteed. 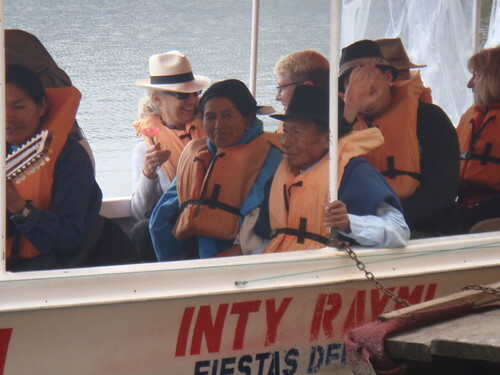 Living with Ecuador shamans helped Merri and me gain special health tips that improved our investing habits and standards of living. We gained extra insights because we were also working with numerous Ayurvedic Indian doctors at the same time. 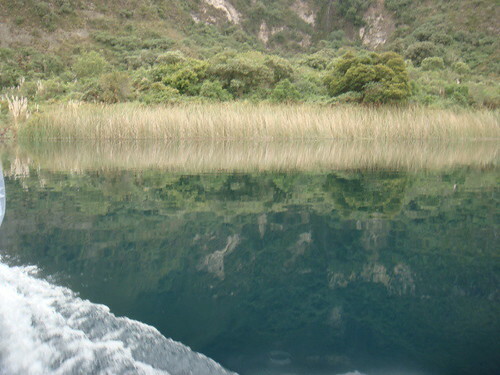 There are many similarities between the Ayurvedic and Andean nutritional sciences. Learning them both, as one, helped us zero in on the basics of each science. These tips have been invaluable because it’s fairly well accepted that the U.S. is the most expensive healthcare system in the world. Many falsely assume that because Americans pay more for healthcare, they get better health (or better health outcomes). Forbes graph from a Commonwealth Fund survey (1). 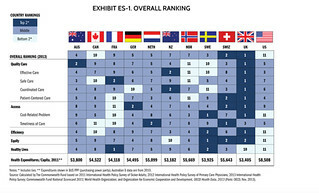 The health care systems of 11 developed countries were reviewed in the Forbes Magazine article linked above. One core platform in Merri’s and my financial and lifestyle plan is to avoid the Western health care system as much as we can. Good health and high energy are essential for making wise decisions and keeping pace with a rapidly changing world. Avoiding the high costs and dangers of excessive medical use of pharmaceuticals and physical interventions that each treat symptoms of health imbalances, but do not create cures, is also essential to maintaining one’s finances. Recently two young MDs visited us to share ideas on how to create an alternative practice. The couple had built a successful practice but no longer believed in what they were doing. They were amazed to discover that Merri and I had not visited a traditional MD in 30 years for any symptom of disease. We also agreed that the Western system is fantastic for crisis intervention. Important when a moth flew into my ear and would not come out! Also very important when I cut my knee with a chain saw. Also important when I fell out of a tree and hit my head, we immediately visited the hospital. Otherwise we focus on maintaining our own health balance. We use nutrition, exercise and essential oils to ward off stress as stress has been identified as one of the key factors that cause the imbalances that are described as disease. There is also a daily routine using essential oils, that can help stop imbalances before they begin. Both Ayurvedic and Andean health disciplines look at good health as a balance between three elements in the body, motion (air), digestion (fire) and the physical components (water). Here is the tip: We can easily spot short term imbalances by observing our moods. If we feel anxious, we have an air imbalance. If angry, the imbalance is fire. When we feel depressed, we have a water imbalance. The fastest way to alter an imbalance is through the lungs and skin, so however I feel in the morning, or if my mood changes through the day, I apply one of three essential oil blends. If depression is the prevailing mood, I use the Stimulator Essential Oil Blend, that contains Eucalyptus, Lemon, Lavender, Cypress and Rosemary. Stimulator stimulates and is a good formula for the winter & immune system support. It moves circulation, soothes aching joints & muscles as it lifts fatigue and promotes clarity. Learn more about the Stimulator blend here. If I feel anxious I use the Soother Essential Oil Blend that contains Cedarwood, Geranium, Patchouli, Orange and Ylang Ylang. This blend soothes & lifts as it balances and grounds the body and mind during transitions. This blend calms the emotions, lifts the spirit and eases nervous tension. Learn about the Soother blend here. When I might feel angry, I use the Rejuvenation Essential Oil Blend. This is my favorite and is my default blend I use most of the time when I am simply feeling balanced and good and want to stay feeling that way. This blend contains Sandalwood (Santalum album of India), Patchouli (Pogostemon cablin of India), Frankincense (Boswellia carteri of Somalia), Geranium (Pelargonium roseum of Madagascar), Rose otto (Rosa damascena of Bulgarian) in 100% Organic Golden Jojoba. Learn more about Rejuvenation blend here. Enjoying life and keeping our finances in order requires balanced emotions in a world filled with seeming instability. Good nutrition, moderate exercise, deep sleep and regular balancing tactics such as using essential oils can help maintain equilibrium in investing and life, when our surroundings are filled with turbulence and turmoil. Here is an idea on how to take care of your own health with As above s0 below nutrition. 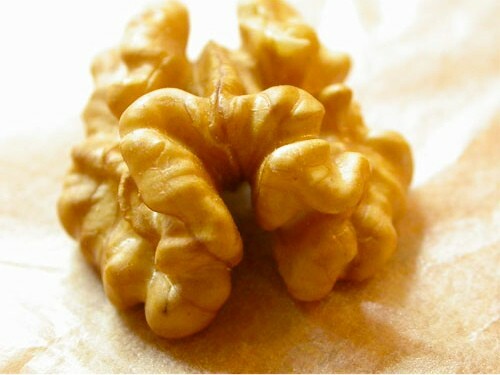 “Look alike foods can enhance nutrition to gain better health”. 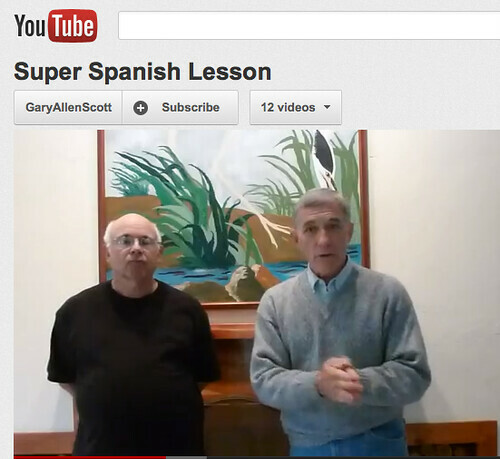 See another way to improve your health and learn Spanish in four days. Surviving shifts with success based nutrition makes sense. One reason Merri and I spent a lot of time in Ecuador was to learn how nutrition affects success. Nutrition is a huge success key because surviving shifts includes using the range of frequencies we know as taste. See below how to gain from change. 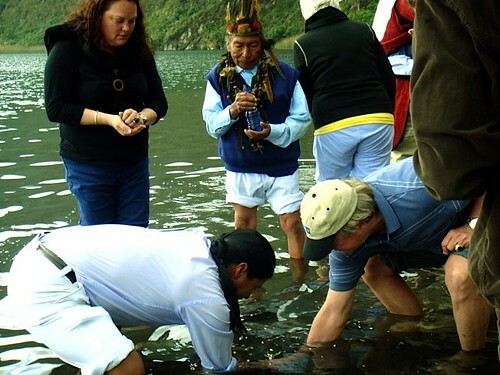 This is the last week to enroll in the upcoming Ecuador shamanic health tour. See details and why learning ancient ways to maintain good health, a clear mind and strong body grow in importance below. 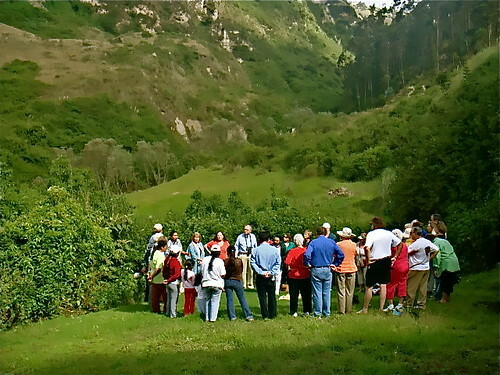 Shamanic tour delegates at the Cotacachi organic gardens helped by US department of Agriculture and Peace Corp. 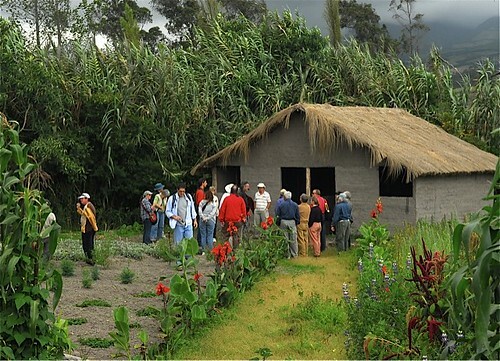 The gardens experiments with growing nutritious food in ancient Andean ways. The potential for stagflation (inflation during a recession) in the western world grows. An excerpt from a Reuters based article “US economic growth slows, inflation surges” at CNBC TV’s site www.moneycontrol.com outlines how the forces are in place when it it says: US economic growth braked sharply in the first quarter as higher food and gasoline prices dampened consumer spending, and sent a broad measure of inflation rising at its fastest pace in 2-1/2 years. Another report on Thursday showed a surprise rise in the number of Americans claiming unemployment benefits last week, which could cast a shadow on expectations for a significant pick-up in output in the second quarter. Growth in gross domestic product — a measure of all goods and services produced within US borders — slowed to a 1.8% annual rate after a 3.1%fourth-quarter pace, the Commerce Department said. Economists had expected a 2% growth pace. Output was also restrained by harsh winter weather, rising imports as well as the weakest government spending in more than 27 years. US government debt prices rose after the data, while stock index futures added to losses. The dollar extended losses against the yen and the euro. Growth in the first quarter was curtailed by a sharp pull back in consumer spending, which expanded at a rate of 2.7% after a strong 4 percent gain in the final three months of 2010. Rising commodity prices meant the consumers, which drive about 70% of US economic activity, had less money to spend on other items. The report also underscored the pain that strong food and gasoline prices are inflicting on households. A broader measure of inflation, the personal consumption expenditures price index, rose at a 3.8% rate — its fastest pace since the third quarter of 2008 — after increasing 1.7% in the fourth quarter. The core index, which excludes food and energy costs, accelerated to a 1.5% rate – the fastest since the fourth quarter of 2009 — from 0.4% in the fourth quarter. The core gauge is closely watched by Fed officials, who would like it around 2%. Many economists believe that bad weather was one big reasons for the drawback and that growth would resume. Let’s hope so. Western stagflation would have an enormous ripple affect dampening economic growth around the world. Even if we do not have accelerated inflation, we must cope with the world’s accelerating pace of change stimulated by the introduction and advancement of more and more new technology. One of the biggest risks many face is the rising cost of health care and the inability to get good health care in an emergency. The simple solution is to remain healthy! We have been looking at ways to adapt and benefit from an increasingly mobile landscape in our “Surviving Shifts” series. The ability to embrace change is of growing importance to survival and success. Accelerated change requires accelerated learning and increased intelligence which we can gain through frequency modulation. Our senses regulate how smart we act. Our senses are our mind’s interpretation of different ranges of frequency. Good nutrition also promotes good health! In fact nutrition may be the second most important factor in health… after consciousness. 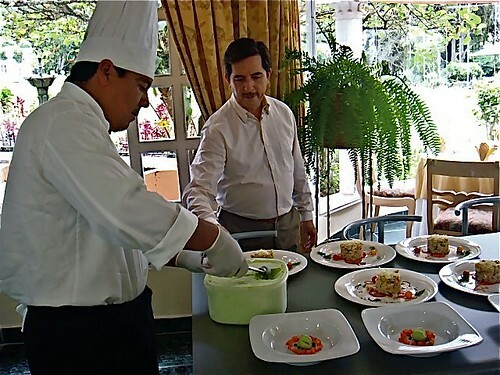 La Mirage Spa and Garden Hotel chef and co owner, Jorge Espinosa, preparing meals based around ancient organic Andean food ideals. 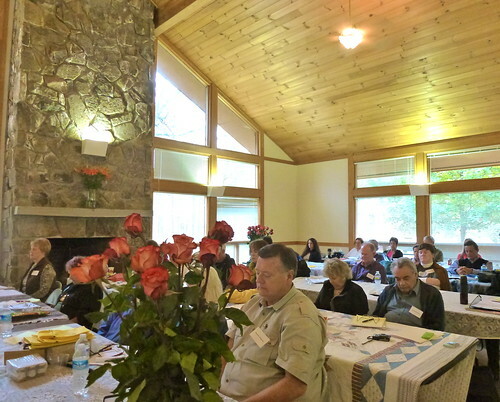 Here is a review of this shamanic nutritional program. This way of eating keeps protein balance without excessive amounts of meat using quinoa, eggs, cheese and yoghurt instead. A great deal of poor health and stress is tied in to the underlying hormonal disturbance caused by the excess production of insulin. This imbalance normally comes from too much food and incorrect protein, carbohydrate, fat balances in the diet. Every time we eat, hormones in our body will change, either good or bad. Delicious food with a balance of 3 parts carbohydrates, two parts protein and one part fat has the power to orchestrate beneficial hormonal changes in our body. Andean nutritional ideals also focus on combining foods in a way that avoid fermentation in the stomach. Foods and spices are divided into three types: neutral, savory and sweet. Neutral can be mixed with savory or sweet, but no savory and sweet foods are mixed. The main neutral foods are grains, cereals, nuts and seeds. Meat and most vegetables are savory. Fruits are sweet. Cereals are ground and soaked to improve their digestibility. Sweet spices include cinnamon, nutmeg, allspice, ginger, mint. Savory spices include salt, pepper, chiles, oregano, corriander, bay leaf, cumin, saffron, fennel. No two fats are mixed nor are fruit types. Eating clean organic food prepared and served by happy, joyful people and eating in good spirits at the right times.Food should be beautiful as well…like this feta salad served at our last course. Balancing nutrition with exercise and sleep. Gentle exercises enhance stress release and reduce hunger. Going to bed before the evening fire cycle begins at 10 PM helps reduce heavy meals that are not well digested during sleep. This site has warned that inflation is coming. Now it is here! 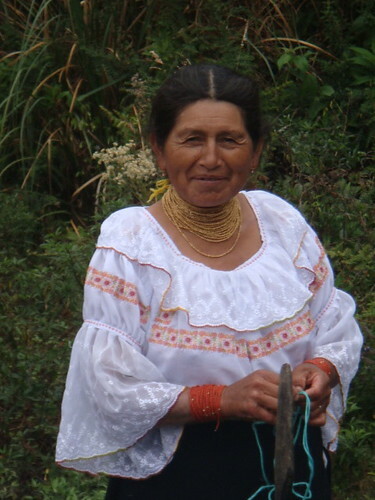 Ecuador shamans help us have inexpensive natural health care. One reason to know more natural health tips from ancient wisdoms such as Ecuador shamanic nutritional ideas is exemplified inan Economist March 17th 2011 special report entitled “Patient heal thyself”. Here is an excerpt from that report: In any discussion about the role of the state, one subject soon dwarfs all others: health care. McKinsey points out that American spending on this has grown at an annual lick of 4.9% over the past 40 years, whereas GDP per person has grown by just 2.1%. Pessimists are convinced nothing can be done to restrain it. His view of what he calls the coming tsunami is as pessimistic as anybody’s. Health costs, he points out, are determined by long-term conditions—things like diabetes, heart disease, obesity and lung disease, which are usually linked to lifestyle and diet. Some 15m Britons suffer from such conditions, which take up 70% of “bed days” in hospitals. The numbers of cases in other countries are equally worrying. They explain why America, which currently spends 16% of its GDP on health care, is theoretically on track to spend 100% of its GDP on health care by 2065, followed soon by Japan. China too has seen a huge rise in such conditions. They are no longer diseases of the old: in America, says Sir John, the Facebook generation is picking them up so rapidly that it might be the first not to live longer than its parents. But they are still mainly diseases of the poor, who live less healthy lives, smoking more, drinking more and consuming more salt and trans fats in processed food. One obvious way to alleviate this problem is to tax the things that are causing it: when governments are having to strengthen their ambulances to cope with heavier patients, it is time for a levy on cheeseburgers. But Sir John reckons that getting patients to help manage their illnesses might be even more promising. Sir John suggests that the NHS should set up an incentive scheme for its workers to lead healthier lives that would create rewards (or, as he likes to call them, “care miles”). That would set a good example. But for the biggest employer in the country it could also save a lot of money. Here is an Ecuador shaman’s health tip. Here’s a Delicious Spring Cleaning Tip. 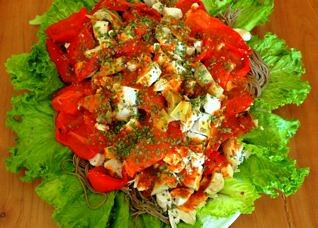 year, low calorie-low fat in spring, high carbohydrate in summer and high protein in winter. This creates a food supply that fits the body’s requirements as it shifts to adapt to each of these seasons. So it’s time to be switching our eating routines. At the beginning of the switch it’s also a good idea to do a bit of purification. Ayurvedic healers recommend internal cleansing at the change of each eating season. Digestion is vital for good health. Spring, is thought the ideal time to rejuvenate digestion, as this is nature’s time for rejuvenation. With the melting of the snows and the thawing of the ground, the fluids in the body also start flowing more freely and performing an internal cleansing routine can help flush toxins out of the body. One way to get cleansing started is to eat plenty of cooked apples and pears to get elimination going in the morning. Prunes, pineapple, papaya and pomegranate are other fruits that aid digestion and cleansing. One trick Merri and I learned from a healer in the Andes is to eat just pineapple for an evening meal (eaten on an empty stomach). This is a great and enjoyable cleansing. 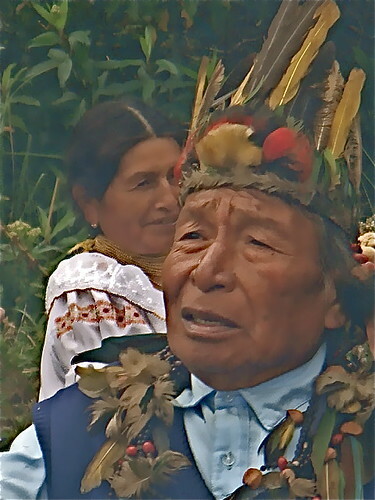 Ecuador shaman’s health is inexpensive. It costs a lot less to enjoy healthy food in Ecuador. A pineapple in Ecuador is 50 cents. Here, $4.99. Down south we can buy a large bag of pears (perhaps 12 to 15 pears) for $1. Here, two pears (not so fresh either) cost $2.29. 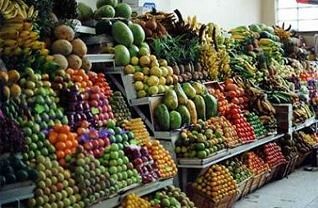 Whether you are in North America, Ecuador or wherever…Spring has sprung… so take a look at your diet. Do some spring cleaning and eat lighter foods now. Learn how to Speak Spanish in four days using Shamanic intelligence ideas. 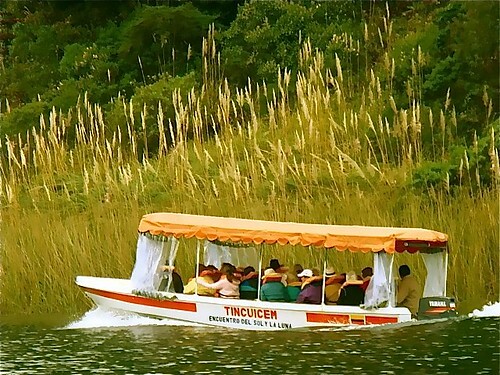 Join Ecuador real estate tours also and enjoy multi tour discounts. Air travel, food and accommodation are not included. 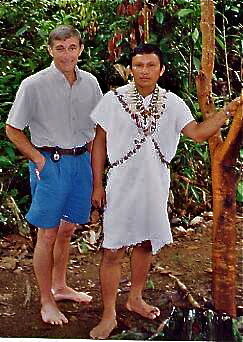 Ecuador Shaman Tours are conducted by Morya Ecuador discovery S.A. Here is a story about New Year’s resolutions. Merri and I hiking into a deep canyon to check out a sacred springs. White evening mists hung over a purple saw-toothed mountain and the temperature crashed faster than the setting sun. The landscape seemed to go straight up and as I slipped in the wet grass and mud, I realized why these darn shamans don’t talk much. 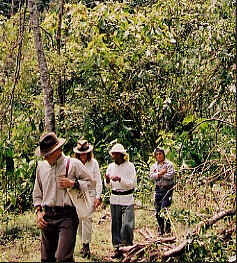 I was deep in the Amazon basin and had been following an Andean healer the whole of the day, deeper and deeper into the wild. 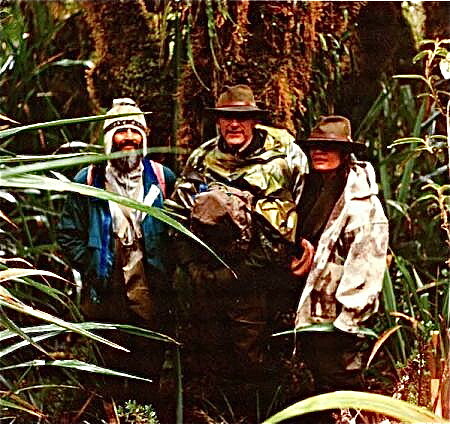 The trek had been through wet bogs and up steep slopes. Our altitude was almost unbreathable and as the oxygen grew less, my reserves waned. Here is the spring. 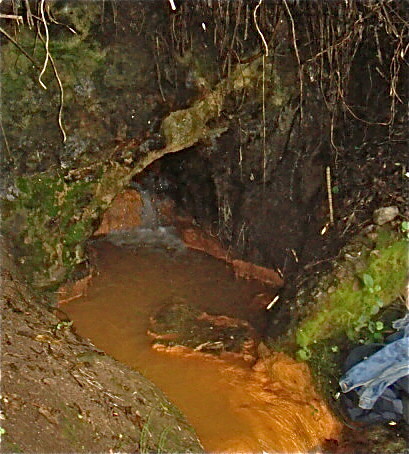 The water flows from the rock face colored gold and effervescent. I knew we still had a long distance to go. Yet a deep evening cold was setting in and we could not stop before we reached the primitive camp. The incline ahead was especially steep and slippery and I wondered how I could see this through. Here we are on a long steep hike out. The shaman looked back and seemed to understand, but said not a word. Instead he simply exaggerated his steps and made them smaller. He seemed to shift from second gear into low and made each step smaller. I tried taking smaller steps also and discovered that this worked! The steeper the hill, the smaller the steps. The greater the challenge, the lower the gear. I don’t think the Shaman needed to take those small steps, but he continued doing so the rest of the way and sure enough, we made it. 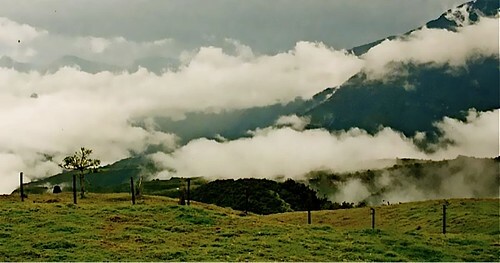 At that top of that easily attained ridge we saw the camp snuggled in the mists and green of the valley below. I slept well that night dreaming about the two new lessons. First, follow men and women of action who lead by example. Beware of those who are people of just many words. 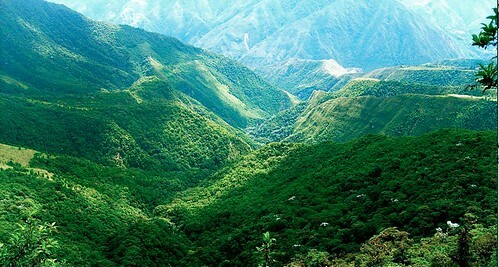 Second, climb your hills in small steps, the tougher the path, the slower you go. Achieve the one small resolve and then build on it. Suddenly you’ll look back and see that all your little achievements have created something that is rather grand. Low gear is the ultimate resolve. My resolution this year is to stick to my resolution for just one day. Tomorrow I’ll worry about tomorrow’s resolution. That’s a pretty small step, but I’ll achieve it and will feel good. Much better than failing a big resolution. Think big in 2011, but take the plan one step at a time. Get in low gear to convert the grand plans into action. Take one small step on a long path, and you will feel good and be better too. We wish you a happy, 2011 filled with resolutions you achieve. We’ll look at more ways to take small steps to success tomorrow. 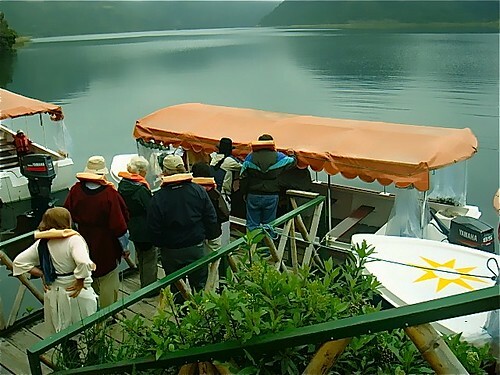 Delegates now visit this spring on Ecuador shamanic minga tours. 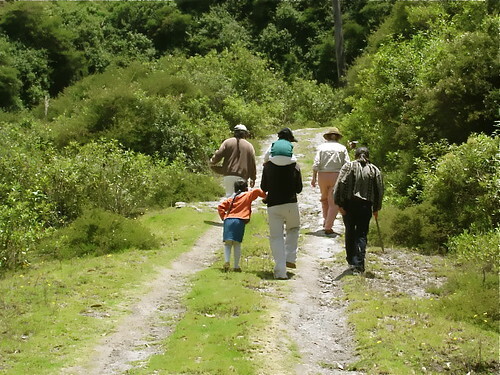 Here is a group hiking in. They are amazed at how much they can do after we show them how to take small steps. Success can come from the cold and in small ways too. This true story has a free health tip that might help us recover from the holiday season. Why my son Jake and I are in the creek and yes… that white stuff is ice and snow. 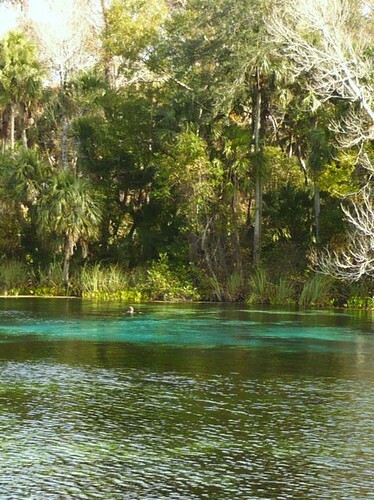 Here is Jake on a cold, blustery January day swimming at Alexander Springs in the Ocala National Forest. Yet jumping in a cold creek or pond… especially on a busy day with deadlines or when its just too cold or when a creek or pond is not available… is not always possible. There is another way… taking one small cold step at a time. Great luck in my early years brought me teachers who were positive role models that helped me learn about cold and the small ways to success. One example was a grade school teacher, in PE. He was a really touch but powerful guiding light. Here is a free tip I learned from him over 50 years ago that you can use now. His name was Frank Smith, MISTER Smith, that is… no one would even think of calling him Frank. This was like the name that cannot be spoken. He was a tough guy, a former Marine who had a bunch of machine gun bullet scars stitched across his stomach, so the story amongst us guys in the jock room went. “Perhaps he was a drill sergeant.” If not a real life drill sergeant really, he was for sure one at heart. If any of us made a single mistake, we hit the floor and did pushups or curl ups till we ached. This made us behave… and also made us strong, which was his goal. When we played badly in football games we crawled on our knees back to the bus. Not if we lost, but if we did not give our best. Once when we won, we crawled. MISTER Smith did not care if we won or lost, just that we gave our all. I was the lousiest player on the team, but he gave me the uniform of a much better player because I tried so hard. 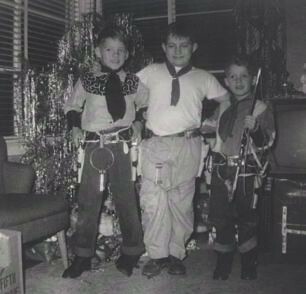 Me (in the middle) with two cousins at circa age 11. I was really fat! I made it and literally tumbled down the stairs from exhaustion into the locker room. MISTER Smith stopped all the boys and said, “This man plays in tomorrow’s game.” He knew I was not the best player being so fat and slow, but just getting that uniform changed my life. That positive statement… that success helped me to grow. I made two key plays as a guard in that game, once sacking the other teams quarterback (I was more surprised than the QB was) and a vital tackle. I cannot remember if we won or lost but do know this success stunned me out of thinking I could not do physical things. Yet it took me 40 years and a shaman to understand what a powerful health tip MISTER Smith had really taught. He made us take a cold showers after each workout. When finished with PE, we hit the locker room, soaped up, cleaned off and then before we left, had to get under and stay for a bit under an icy cold stream. MISTER Smith would stand at the shower exit and test each person’s shoulder. If it was not chilled, back into that cold water! 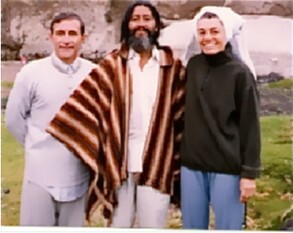 Decades later Merri and I moved to the Andes and invited a shaman and his apprentices to live with us on our land. We lived as they did, said their prayers, ate their food, woke and rested when they did and joined in on their work and exercises. Each morning we rose at 4:30 to 5:00am (before the sunrise) and did a series of strenuous exercises. Then the shaman insisted that we take a cold shower and then air dry! Here is why he explained. This made sense to me and from that day (most mornings) I either take a cold shower after my morning exercise and hot shower, or when at home in North Carolina, jump in the creek or in Florida in the pool or lake. This is very stimulating when the temperature is 10 or 15 degrees F in NC or 25 in Florida! The shaman explained that the benefit of letting the cold air dry us out is that the evaporation process removes free radicals from the skin thus cleansing us from the outside in. There is one more benefit when you get the water really cold. On cold mornings I feel like taking a hot bath, wrapping up and sitting by the fire… fearing the cold. If i can take just that one small step… having a little courage to face that cold water… I feel ready to take the next step. The skin is so stimulated. The body really awakens. One feels fresh and the fear of cold is gone… taking with it other fears as well. A stimulating start in the morning… the facing and beating back of a primeval fear… this is one small success we can build on… right at the start of the day. Inner control you gain conquering that cold… can make you stronger and encourage success in all fields of life. This may not seem like the easiest way to enhance your health and wealth, but it is easier than you think. This does not cost a cent and once you get in the habit, nothing feels better. If you can’t do it, cold turkey… start with the water lukewarm. Each day turn it a little cooler until reaching the temperature you feel is brisk and invigorating for you. This is not a contest. Some body types like and need water warmer than others. Remember the important Golden Rule of Healthy Living, “Medicine is dose”. Also “be careful” in any shower (at all times) so you do not slip. Have a good handrail and non slip surface to help you stay afoot when the chilly water arrives! Remember Success is Best Served Cold! 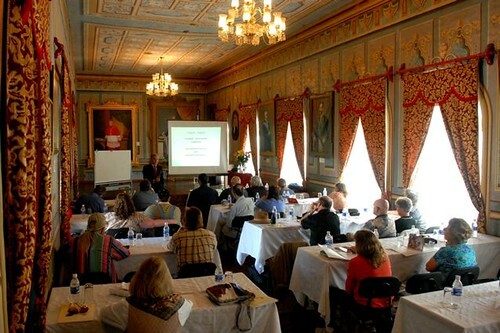 Learn how to use FM Plus (Frequency Modulation) to think out of the box when investing and in business at our February 11 – 12 2011, Mt. Dora, International Business Made EZ. Because farming is one of my numerous ventures and loves… there can be terror in the weather. I grow oranges… others in our family are heavily involved in tomatoes and strawberries. 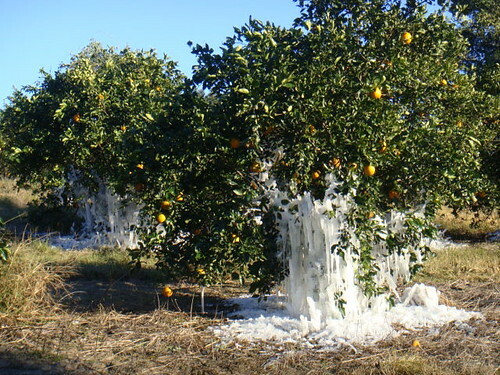 This is terror in an orange grove! With temperatures in the mid 20s, I have been watching the the weather and the Old Farmer’s almanac… a lot. 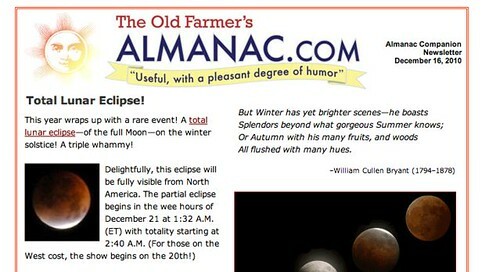 Yesterday, The Old Farmer’s Almanac said: Total Lunar Eclipse! This year wraps up with a rare event! A total lunar eclipse—of the full Moon—on the winter solstice! A triple whammy! Ecuador shamans react even more strongly and I used to scoff at that until Merri and I ignored the yatchak we were living with about a decade ago and I almost died… so I am now more aware of planetary alignments! The eclipse is “another story for another time” as Bastian Balthazar Bux might say (more on Bastian in a future message). Today – more details on frequency and astrology. I believe that all things can be viewed in terms of frequency. This includes planets… and this thought led me to a theory that astrology is about understanding the impact of planetary frequency on our bodies… and hence how we might be likely to act… plus a bit more so let’s look at what astrology can do to help one’s health and wealth. Astrology has to do with 7th Degree Exploration which simply means to ask why 7 times. Seven degrees of exploration is one way of thinking outside the box. Thinking out of the box is essential to cope with accelerated change. Here are photos I took on a shamanic tour. Problems arise when our thought process resists rather than embraces change. Combining our logic and intuition assure that this is less likely to happen. Our FM Plus Training helps delegates learn how to absorb, retain and recall more information. This helps improve our logic. Delegates at a previous FM Plus (Super Thinking plus) course. Many Ecuador shamans and shamanas teach the Eagle & Condo Prophesy… a time will come when the eagle and condor fly in the skies together. 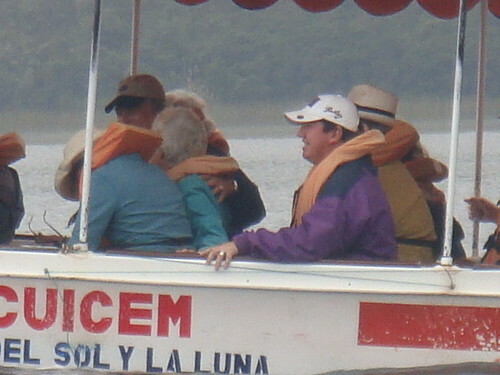 Many believe that the eagle represents logic and the condor intuition. The prophesy says that sharing of indigenous knowledge with the technologies of science will help balance mankind. But most believe now that the time has come, the events enacted and are in place now. Every society… every culture… is pretty well programmed. From the minute we are born… TV, radio, internet, school, Church, the media… everyone we talk to… and more create beliefs. When change alters circumstances so they no longer fall within those beliefs, then there can be (usually is) fear. Enough change takes us beyond fear to terror. Mix terror and enough people. Stampede. Runs on banks… flu vaccine runs out…. stock markets crash… stores get emptied, etc. The terror does not come from reality but from perceptions created from programming within a cultural box. One way to get out of the box is through intellectual play. A game is a structured activity, with a set of rules. This is important… because when we play… we can create a set of rules that is beyond the norm… outside the box of logic… so our information processing and decision making can escape the tyranny of reason. Playing is usually undertaken for enjoyment. This makes play ver important as well. When we do something fun… without risk…we do it better. We can let our imagination soar so we can see eventualities in enjoyable, non threatening ways. When games eliminate play… they lose impact… thus the demise of professional sports which are no longer games… but big business. One way we can play is to form ideas from our intuition. Then we apply the game’s set of rules that change the circumstances of the idea. 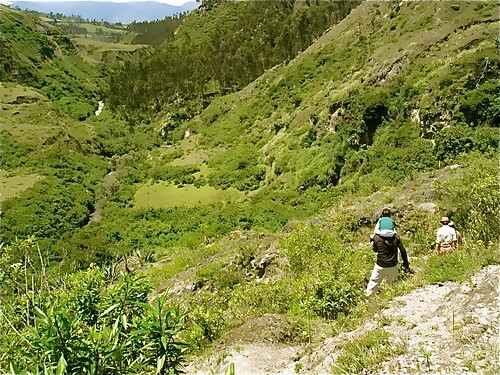 One game that the Ecuador shamans taught us to play to increase and trust our intuition is to hike steep trails with our eyes closed. 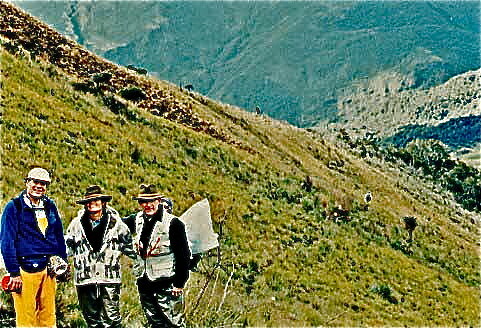 This is the first time above that we received this lesson when Merri and I along with our friend, Dr. Jay Glaser, and several others hiked into the sacred Llanganatis Valley in Ecuador. This was a narrow trail on a steep edge. What a game! But you can see above how funny we thought it was! Her first gig was before 4,000 fans! In the ensuing year she was able to meet many of her rock star heroes as work associates. This was an incredible experience for her, but as mentioned the entertainment business is a long shot. Some stars may become rich but backup vocals?…so she had to work elsewhere to survive. Her “make money” jobs included handing out pamphlets, selling by phone and teaching dance at a franchised performing arts school called “Stagecoach”. Now she has five schools and is one of the most successful franchisees in that business (there are hundreds of them). his wife. 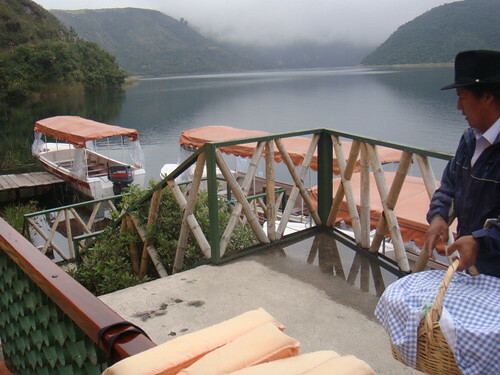 See details of the March 2011 shamanic tour here. Yet we supported our daughter’s success based on the realization that every moment there are possibilities that our logic just cannot see but that Vedic Astrology can suggest. The inability to measure the results of astrology used to bother me enormously until years ago I read an article about Aristotle Onassis, the ultra rich Greek shipping magnate. He gave the secret of being a billionaire that helped me look beyond my logic. Onassis’ statement really struck a chord with me as my six years of residence in Hong Kong had exposed me to many businessmen who looked beyond logic. I heeded the astrological advice because the Chinese are very into what some might consider offbeat and unreal thinking, but there were more billionaires per capita in Hong Kong than anywhere else in the world! We all have to make some decisions based on events we cannot totally predict, but successful billionaires make huge decisions based on enormous unknowns. It requires incredible faith to take incredible risks. None of us can see the whole picture but Astrology, albeit vaguely, helps us see the biggest picture of all. This did not matter for me anyway, as I do not use astrology as a predictive system. I find the data extremely useful and gets me to think outside the box. So, as one of the aspects of 7th Degree Exploration, we are offering a two course led by Blaine Watson! 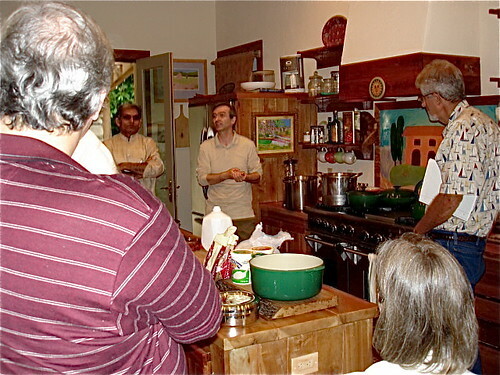 Here is Blaine Watson and Vaidya Mishra teaching at our farm. 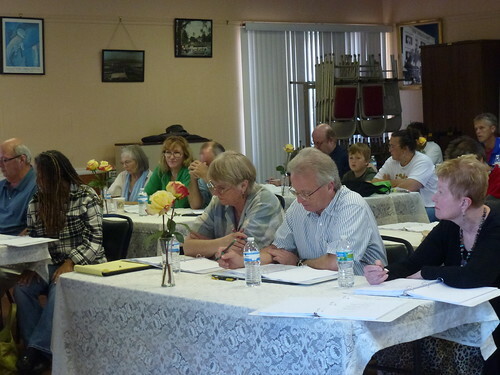 See details of Blaine Watson’s next course on astrology April 9-10, 2011 in Mt. Dora.